A group of whisky lovers is breaking all the rules when it comes to drinking Scotch, injecting a high-level dosage of ‘fun’ back into the category. Lew Bryson reports. When you hear the words ‘whisky blasphemy,’ what do you picture? Macallan on the rocks? Not blasphemous enough. A Lagavulin Rob Roy? You're getting warmer, but still too cautious. Yeah, that's ‘whisky blasphemy’. That's also the name of a fast-growing whisky club in the Philadelphia suburbs, and beyond, as the blasphemy spreads on their Facebook page of more than 2,300 members. I sat down with the founders – Judd Weisgal, Jun Nunez, and Matt Kinson – recently over Aberlour A'Bunadh Old Fashioneds, made with orange and chocolate bitters. Don't make that face; they were delicious. It works; there is no trolling, no flaming and no bullying on the page. They simply don't stand for it. ‘No one picks on people, no one judges,’ Weisgal says. ‘Every hobby has snobs, purists, elitists; they also have a group who doesn't feel bound by rules. We're the first one of those groups that has a voice.’ It's loud, and people are hearing it, and they like it. Before Blasphemy, though, there was Weisgal, who had about 250 bottles in his collection, and Nunez, who had about 1,000. ‘I bought big when the prices were still good,’ he says, and the older bottles he pours prove it. Weisgal's at his regular liquor store, and the manager tells him there's 'this guy Jun you have to meet’. Nunez was doing a blending experiment with one-gallon Sherry casks. ‘I was doing a solera, ageing and blending cask strength whiskies,’ he recalls, as if this was something people do in their homes every day. ‘I poured Judd a sample, and he's picking out the whiskies in the blend! I like this guy!’ That was about five years ago. Kinson, a friend of Weisgal’s, joined in the fun soon after. A couple of years later, the three were at Nunez’s house, talking about how to break one of their favourite guys at Holt's Cigars out of his Johnnie Walker Blue rut. He loves Blue, won't drink anything else, won't even think about it. That's when Kinson dropped the jello shot bomb. With grins all around, it wasn't long before the group had a name, ‘Whisky Blasphemy’, and soon they were meeting at Holt's every Thursday night (they did make the jello shots, with Blue, and it did work). The cocktails started early. ‘We like cocktails,’ Judd says, ‘and the best cocktails come from the best ingredients.’ Maybe the definitive Whisky Blasphemy cocktail story is the one where Nunez had won some money in Las Vegas, and says to his bartender: ‘Make me an Old Fashioned with that 25-year-old Macallan.’ The bartender calls his manager over, asks him if it's okay. ‘Sure,’ the manager says, ‘and make me one, too.’ He wound up putting it on the bar's menu as a ‘High Roller’. Score one for Blasphemy; score one for Scotch whisky. I first met Nunez and Weisgal in early 2015, at a liquor store event. They introduced themselves, talked a lot about Whisky Blasphemy, which I'd never heard of; talked a lot about cocktails made with cask strength Ardbeg and Pappy Van Winkle. They talked a lot, honestly, and sounded crazy, but it was fun. They invited me to join them at a Thursday night meeting. I didn't get there till almost a year later, and it was an eye-opener. In that year the club had grown explosively, and garnered the attention of Glenmorangie's David Blackmore. I joined him and a very proud trio of ‘blasphemers’ (and about 30 other members) midday for the simulcast US launch of the Glenmorangie Private Edition Milsean. There were decorations everywhere, the big screen where Dr. Lumsden would Skype in from Scotland, and even representatives from the Pennsylvania state liquor monopoly were there to take orders for bottles. The other launch locations were in Chicago and San Francisco, and I can tell you they weren't having as much fun as we were. Cocktails were being invented right on the bar, cigars were lit and everyone was friendly. Whisky Blasphemy was on the map. That doesn't sound blasphemous at all. Method: Shake and pour into a Double Old Fashioned glass with a big ice cube. Garnish with a Woodford Reserve Cherry. 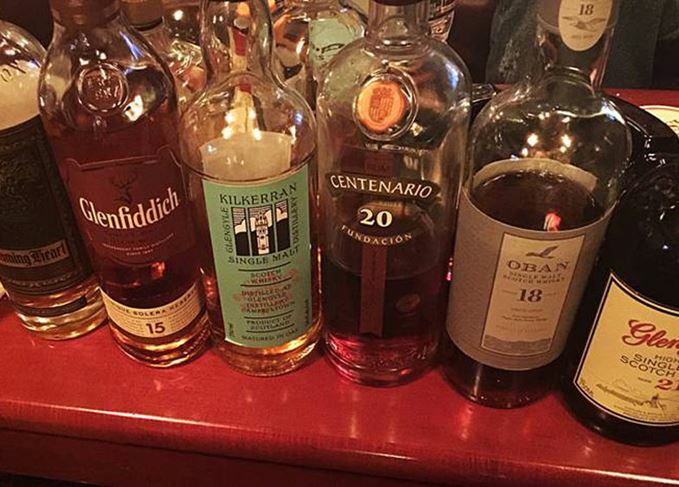 Move over Bourbon; it’s time for Scotch whisky to take on the Old Fashioned. From stocking fillers to blowout experiences, we’ve got presents for whisky fans on every level. Despite endless interpretations, the attraction of the Old Fashioned lies in its simplicity. Scotch brands and classic cocktails are failing to inspire bartenders, says Becky Paskin.